I'm looking for a database that has project management and IT articles. - Ask Us! Q. I'm looking for a database that has project management and IT articles. If you're looking for articles to do with IT and project management, a good place to begin is ABI/Inform. It's available from the Library home page by clicking on the DATABASES tab. It's also listed as a "quick link" on the DATABASES tab. Business Source Complete is another option. 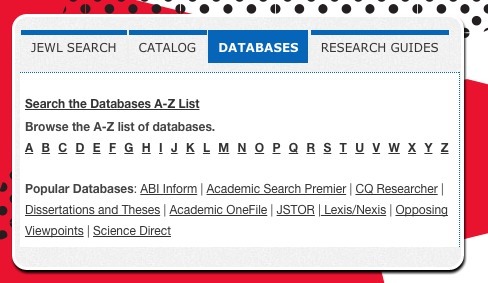 It can be found by choosing "B" from the databases list. Below is also a link to our IT Project Management guide which will have more specialized sources.